Equalizer Systems of Days Corporation will begin carrying the SnapPad lineup of permanent jack pads immediately. Interested rally attendees visit the Equalizer booth with SnapPad at a recent rally. We’re excited to be working with Equalizer Systems directly. It has massive benefits for both companies as far as design, distribution, and customer support. Origen RV Accessories, parent company of RV SnapPad, is happy to announce a new supplier agreement with Equalizer Systems, a division of Days Corporation. 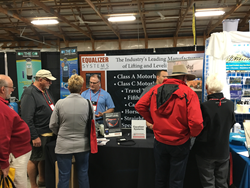 Equalizer Systems partnered with RV SnapPad to carry their lineup of permanent jackpads and levelers for Equalizer System’s proprietary RV and motorhome leveling products. Jason Loose, Division Director at Equalizer Systems, said, “When I first saw the RV SnapPad I knew that it was going to be a great add on for our jacks. It helps with so many things that we had to partner up with them”. Earlier this year, RV SnapPad announced their Equalizer compatible lineup of permanent RV jack pads, titled “SnapPad EQ”. Since then, the company has released many variants of SnapPad EQ for different configurations of landing feet for Class A motorhomes and fifth wheels. “We’re excited to be working with Equalizer Systems directly. It has massive benefits for both companies as far as design, distribution, and customer support," says Devon Wilson, COO of RV SnapPad. Because of the new agreement, Equalizer Systems will begin selling SnapPad EQ pads at their online store, as well as throughout a select number of RV rallies later this year. SnapPad EQ ranges in price from $169 to $299, and can be purchased directly from SnapPad or from the Equalizer Systems parts store. For more information on Equalizer Systems, visit their site.